InXave.com can ship anywhere in the world as long as our carrier support this destination. Our system is capable of giving you shipping quotes in real time. Free shipping offers will be for the lower 48 states only. Hawaii, Alaska and Purto Rico will see shipping surcharges. Allow 24-48 to prepare your order for shipment. Arrival dates are estimated ones and are not guaranteed. Carriers are being affected by weather or transportation conditions will dictate arrival date and time. With each order you will be given a tracking number which will be your way to follow it up. International shipment are subject to customs and possible fees which need to be paid by the buyer. We will not be responsible for lost packages, custom delays, fees or any other uncontrolled issues. We will secure packages in the best way known to us to protect your items. We at InXave.com normally don't offer local pick up. However, if you contact us and the item you need is in stock we will be happy to help with it. Please consult our address and operational hours prior to your arrival. We will not be able to service "Walk ins". Please make sure we are available, can service you and the Pick Up has been Authorized by our professional staff. Please bring all necessary info such as your order paper invoice, ID, and if needed Credit Card for payment. We do not charge for pick up. - Chips don"t work - requires returning the product with its original package. - Damaged Product during shipment - Require pictures of the package and the damaged product. 1. A request must be recorded with our Customer Service professional. 2. A reason for the request must be recorded by our customer service professional. 3. Items must be returned untouched, Unopened in their original packaging. Buyer Pays for return Shipping! 4. Once received, it will go over inspection to ensure all above conditions are met. 5. A refund of 80% of the value will be issued. 20% restocking fee! For any claims please contact our customer service with the above information. Used cartridges and not DOA (Dead On Arrival) will not be replaced or refunded! Information to where to ship your products will be given by our customer service professional. - No warranty for printheads. InXave.com is part of JeTech, Inc. We are an established operation located in the Atlanta metro area, GA. As a continuation to our promise for new products we have launched our own brand of ink – JeTechInk™. InXave.com is a new, shopping dedicated environment for those who are looking for High Performance, High Quality replacement ink cartridges and pay significantly less. Less hustle when converting, plug and play operation, easy mix and match and it is proudly made here in the US. We know you are going to like it since we make ink and delivering it with “passion”. How long InXave.com inks been out there? InXave.com is using mainly JeTechInk™ Brand inks. They are a fairly new brand, however, the inks were sold and used by hundreds, even thousands of customers with immense success. They are proven and do work. This is not a new beginning for the ink, only the brand. Are your Chips and RFIDs working properly? Absolutely! in fact, each chip is being tested before and after insertion into the cartridge. We have absolutely the best, most stable chip technology and algorithms in the market. If you experience failure, it is normally due to contact with the prongs in your printer. Take the cartridge out and gently with a pencil eraser clean the contacts. Re-insert the cartridge or individual “key” / ”Card” back. This procedure cures most of the contact problems. Do you offer a Recycling program? Yes, we do. We at InXave.com take the environment very seriously and trying to implement recycling processes that will benefit our planet. Currently we recycle HP and Epson cartridges only. We hope to grow this program in the future. We offer $0.5 per empty, good condition cartridge and we will pick it up with our carrier account as long as there is at least 15 cartridges. Contact our customer service at CustomerService@inxave.com for more info. What is the correct way to convert to InXave.com ink cartridges? Print head condition prior to conversion – in case your print head status is not good and regular cleaning procedures are not working, regardless of the current ink in your system you will need to use our recommended flushing procedure, using our dedicated cleaning solution for your ink, printer and print head. Depending on many factors this may succeed or fail. If it is helping empty the cleaning solution and introduce our ink. In a severe case of head damage, a replacement is highly recommended so you can fully enjoy our ink. Flush the current ink with your current ink manufacturer cleaning solution cartridge. This will clear the old ink from the lines and print head. 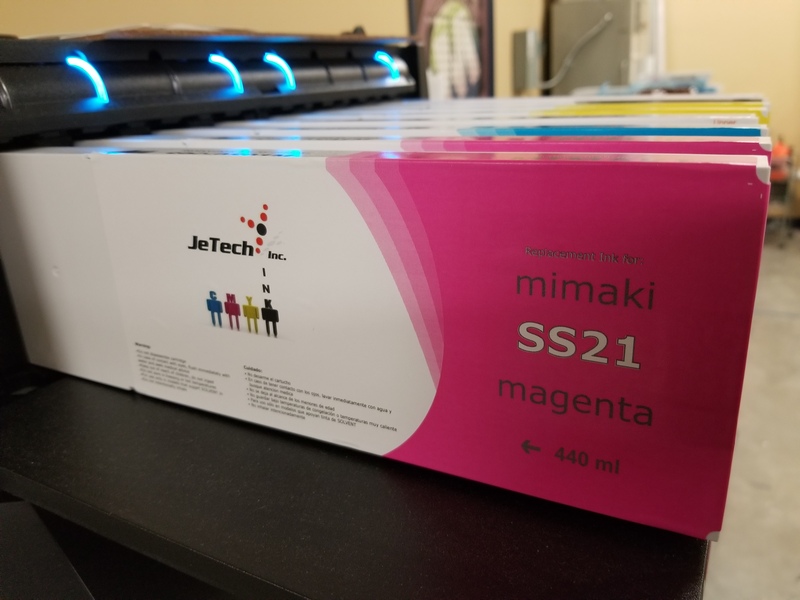 Flush the old flush/ink using JeTechInk™ adequate cleaning solution for your ink type, cartridge, printer and print head. This will recondition the ink train and make it ready for our ink. Push all the cleaning solution out, plug in JeTechInk™ cartridge and make sure it properly filling up the ink train. Check your head test to verify all nozzles are there. Repeat purging until your head status shows good status. 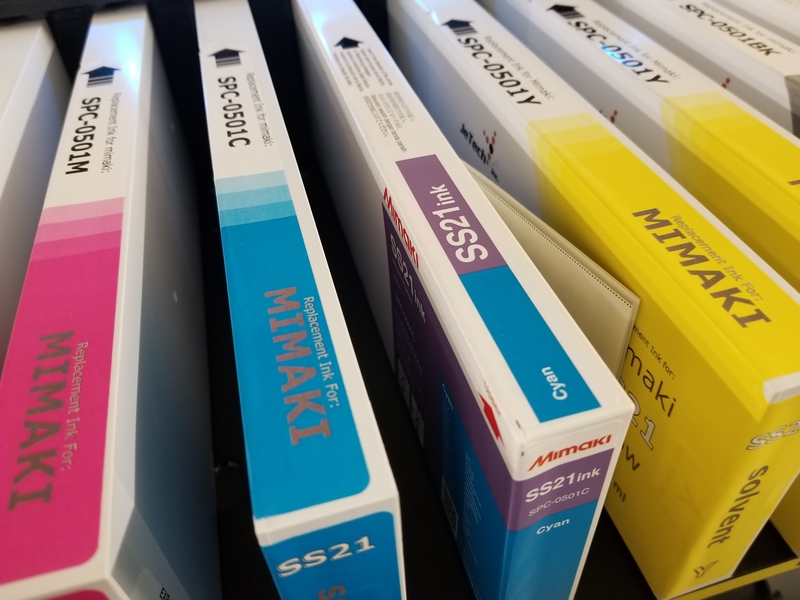 Use your original OEM ink profiles that came with your printer. Can you really Mix & Match ink cartridges? 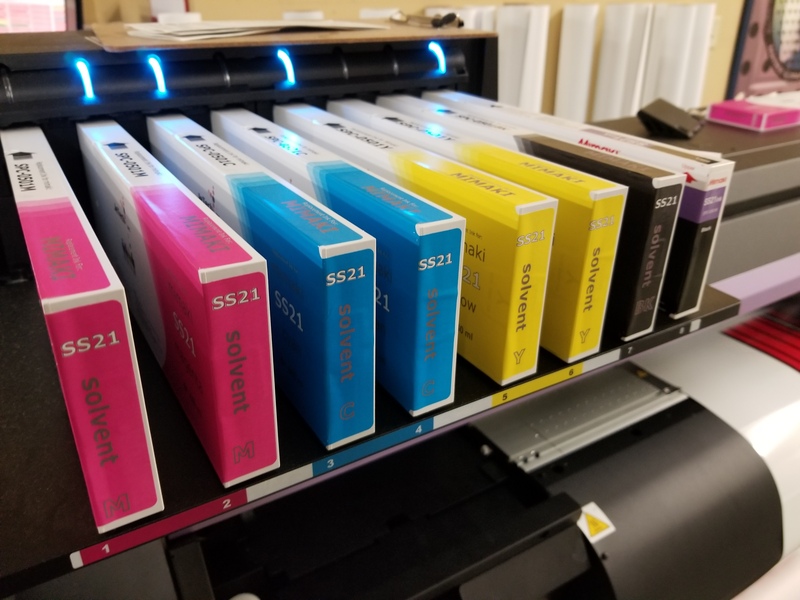 Here are pictures of a Mimaki running our SS21 mild solvent cartridges and you can see how slowly they are adding our cartridges. Cyan is now our InXave.com JeTechInk™ Brand ink cartridge and we are left with only Black OEM cartridge!